Nazdar SourceOne is pleased to announce its participation in the upcoming ISS Orlando trade show, September 6-8 at the Orange County Convention Center. Located in booth #610, Nazdar SourceOne will be featuring live print demonstrations from the new Epson SureColor F2100 direct-to-garment printer. Also featured will be the Stahl’s Hotronix Auto-Open Heat Press and information on the latest textile screen inks from Wilflex, MagnaColours, International Coatings, and ImageStar Silicone. Nazdar SourceOne is pleased to announce plans to exhibit at the NBM Indianapolis trade show held at the Indiana Convention Center & Lucus Oil Stadium Halls B/C on September 13-15. Nazdar SourceOne is pleased to announce the addition of the Epson Sure Color F2000 Series Direct-To-Garment printers to its full line of printing equipment solutions. Nazdar SourceOne is pleased to announce that Jerry Hall has joined the organization as West Regional Sales Manager for the Textile Inks Business Unit. Jerry will be responsible for leading the Sales Team and driving continued growth in the textile markets for the West Region. Nazdar SourceOne is pleased to announce the all new ImageStar ProTex chemistry and emulsions. 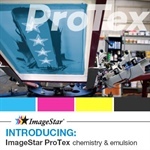 The ImageStar ProTex line of screen printing chemistry and emulsion is specifically designed for the challenges of today’s garment printing. The ProTex line includes nine different products, each designed to improve the quality of the print and the efficiency of the screen printing process. Nazdar SourceOne is pleased to announce David Poto and Bill Geers have joined the Sales team as Account Executives for the SourceOne Graphic Business Unit. In these roles, they will be responsible for developing and increasing graphic sales opportunities within their respective regions. David is part of the Graphic Business Unit West Region and will be based out of Chicago, Illinois. Bill is part of the Graphic Business Unit East Region and will be based out of Cincinnati, Ohio. Nazdar SourceOne is pleased to announce the addition of Sam Evans and Jordyn Ruhnke to the Nazdar SourceOne Inside Sales team. In the roles as Inside Sales Representative, Jordyn and Sam will be implementing inside sales strategies and campaigns designed to increase the sale of products and services to new and existing customers within the graphic market segment. Nazdar SourceOne is pleased to announce that both the Nazdar SourceOne Customer Service Team as well as Greg Markus have been awarded a 2015 REGGIE award, presented by the 2 Regular Guys Podcast. Nazdar SourceOne is pleased to announce that Ashley Barnes has joined the Nazdar SourceOne Inside Sales team as Inside Sales Representative. In her role, Ashley will be implementing Inside Sales strategies and campaigns designed to increase the sale of products and services to new and existing customers within the Graphic Arts Industry.